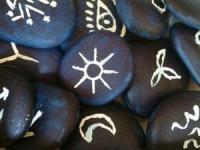 Considered to be both magical and mystical, Wiccan tattoos can certainly cause a stir, depending on your point of view. Come learn more about the "Old Path" and its symbolism, then decide for yourself if they're worth all the controversy. Although there are no set rules to Wicca, it's generally considered a Neopagan religion that loosely mixes the worship of nature with magic. Some scholars claim Wiccan practices are an extension of witchcraft, but since members must be initiated into the religion and are urged to keep silent about ritual practices, Wicca remains shrouded in mystery. This undoubtedly gives the practice some of its glamour and appeal. 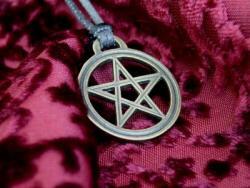 The practice of Wicca is largely based on a declaration of ethics: "Do what you will, so long as it harms none". This declaration is enhanced by the Law of Threefold Return that espouses the belief that the energy you put out in the world, good or bad, will return to you three times as great as when it left you. This is similar to the concept of Karma in some Asian religions. As the old saying goes, what goes around comes around. The central figures of Wicca are the God and Goddess, and all initiates become priests and priestesses who strive to create a union with these beings. Some versions of Wicca believe the Goddess alone is the supreme being. The Goddess is a central figure in Wiccan worship, and Wiccan tattoos portray her in many ways. Mother Earth: This characterization features the Goddess as Gaea, carrying the male god inside her womb. This image comments on the belief of some Wiccan followers that the Goddess is the supreme being of the two, and the giver of all life. The Moon: This version of the Goddess portrays her as an opposite yet equal force to the God, who in this instance would be represented by the sun. Here we find shades of the ancient Chinese theory of Yin and Yang; light and dark, positive and negative, and so on. Maiden, Mother and Crone: This is generally considered an extension of the moon imagery. The maiden represents the waxing phase of the moon, the mother becomes the full moon and the crone is the moon in its waning phase. This imagery is sometimes referred to as the "Triple Goddess". The Sun: As mentioned earlier, this would be the counterpart to the Moon Goddess. The Horned God: Here we have some classic imagery that has been repeated in many cultures through the ages. The Horned God is often thought of as part hunter, part magician. His typical representation is a man with the head of a ram, and hooves instead of feet. Sometimes he has wings, sometimes not. This same imagery has also been used to represent the Judeo-Christian figure of Satan, and has no doubt contributed to some of the negative social views about Wicca. The relationship of the God and Goddess to the sun and moon aside, not all sun, moon and star imagery is considered a strictly Wiccan theme. This imagery experienced a huge surge in popularity at the turn of the millennium when "New Age" themes became the current rage. Wiccan tattoos might use these symbols in their simplest forms, or use the outlines to create fantasy images for the God and Goddess. There really is no limit beyond the artist's imagination. 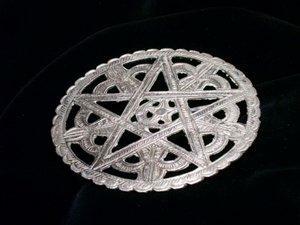 No discussion about Wiccan tattoos could ever be complete without touching on the imagery of the pentagram.The pentagram, sometimes referred to as a pentacle, is a five pointed star, often wrapped in a circle. The five points are meant to represent the traditional four elements of earth, fire, water and air, and the non-traditional fifth element of spirit. To some, the pentagram symbolizes the five elements and their relationship to the Earth and each other as simple forces of nature. To others, the symbol (when shown pointed downward) is attributed an evil connotation often associated with Satanic rituals and worship - although today this is more likely due to its use in modern horror films. Wiccan rituals are surrounded in a deep vale of secrecy that makes it hard to either confirm or deny how the pentagram is actually used. Bottom line, the pentagram is bound to have a very personal meaning to the person wearing the tattoo, a meaning you won't discover unless you ask him/her about it. Whether you are a practitioner of Wicca or not, there's no doubt that there is some fabulous imagery involved here that lends itself to creating some awesome tats. Just be sure you understand the meaning of any symbol you might choose to use as a basis for a tattoo, because you're bound to be asked about it.